Due to increased constructions in limited space, not all living rooms are spacious. You can decorate your room with creative ideas and little observations. We are here to make your dream come true. Here is the example for comparatively compact living room. 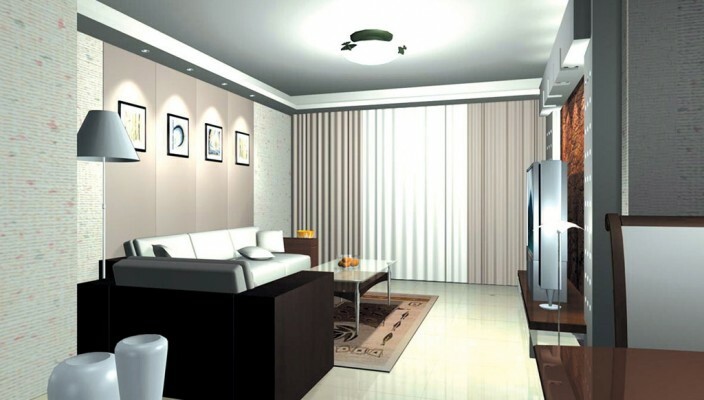 This satisfies basics of living room with trendy look. Three plus one sofa set faces TV. Table top TV has unique background with wooden floor based unit. It has storage for other relate accessories that occupies complete wall. A big French window welcomes the sunlight. The ceiling lamp and lamps above the TV unit, delights the home in the evening. A wall behind sofa reserves the place for frames that reflects designer’s taste. A traditional lamp shade increases beauty of the room. A contrast color of sofa mattress can add to the look. Things like lighting and storage are not too expensive and you can change them with changing trend.